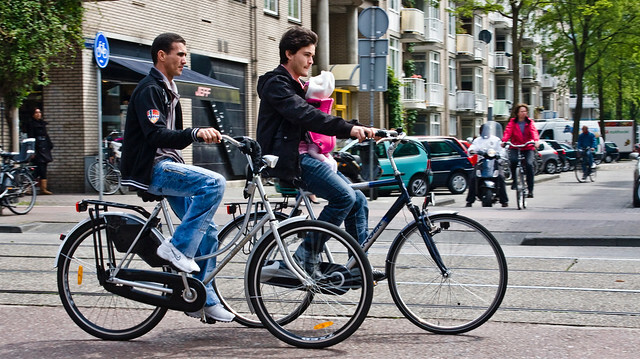 When a bicycle culture is mainstream, strong and thriving the bicycle is part of every stage of life. Cycling whilst pregant is recommended - just short of prescribed - by doctors in Denmark and I've heard a number of stories about women cycling to the hospital with contractions. Here's a previous post about cycling whilst pregant and you can also check out the Bicycles and Pregnancy tag. This post is about how to transport the little ones around once they're out. 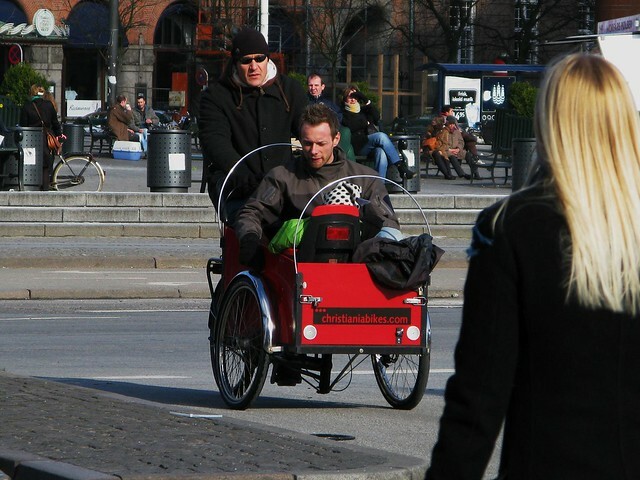 Again, the bicycle is key in Copenhagen, as is the classic cargo bike. 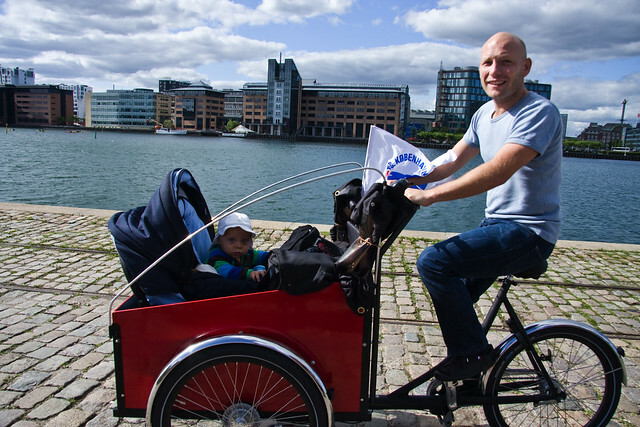 If you have kids in Copenhagen you either own a cargo bike or have considered buying one. In fact, 25% of all families with two or more kids own one. Either as primary transport in a car-free family or as a second car. The child in the top photo has just mastered the art of sitting up it would seem. But they aren't born sitting up, now are they? You still have to go about your daily business. 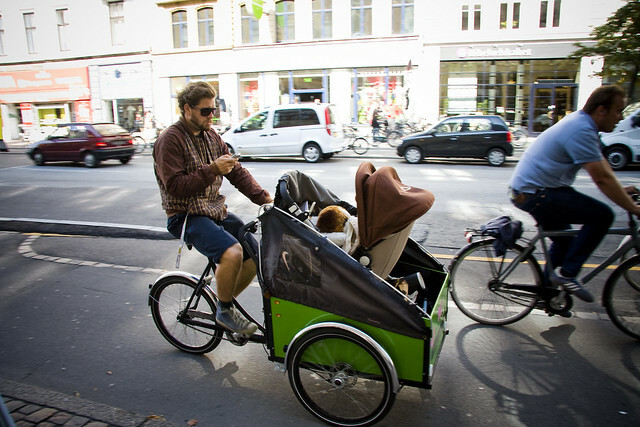 Like my friend Søren, above, who used his cargo bike while on paternity leave. Yes, men in Denmark get a generous paternity leave. The cargo bike provides comfortable, pratical transport for getting around town with a baby. Søren uses a classic Copenhagen solution. He takes the top half off of the baby's pram and merely sticks it in the cargo bay. Easy. Here's another version of the same concept. Many parents also just use a car seat in the cargo bay. This gentleman - also on paternity leave - had a clever combi-idea. 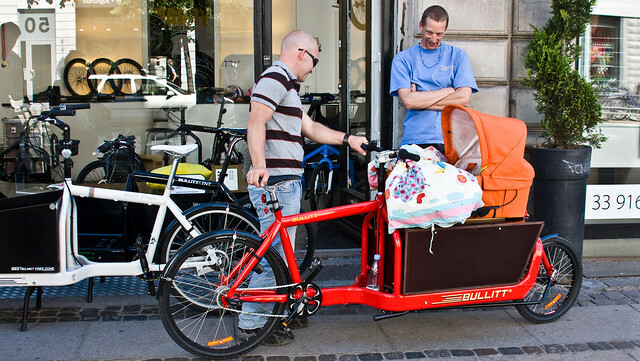 He built a custom box for his Bullitt cargo bike and, on top, he placed the same click-system that is on the bottom half of the pram. So he just clicks the top half off the pram and clicks into onto the bicycle to transport his four-month old baby around by bicycle. Maintaining that all-important eye-contact if the youngster is awake. This is a variation on the theme. A kids bike seat propped into the cargo bay. Add an adult friend and you're off around the city. Or bring grandma along for the ride. Nobody is saying you need a cargo bike. 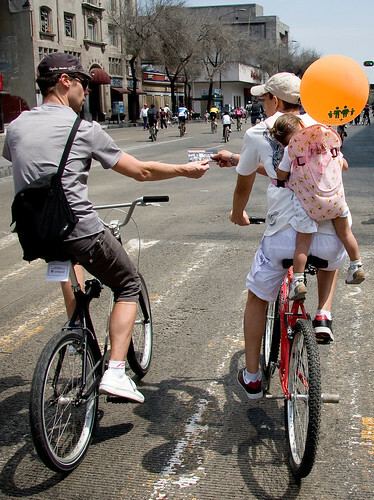 This gentleman was enjoying a casual Sunday bike ride in Mexico City with his sleepy kid on his back. And this chap in Amsterdam has his infant on his front. 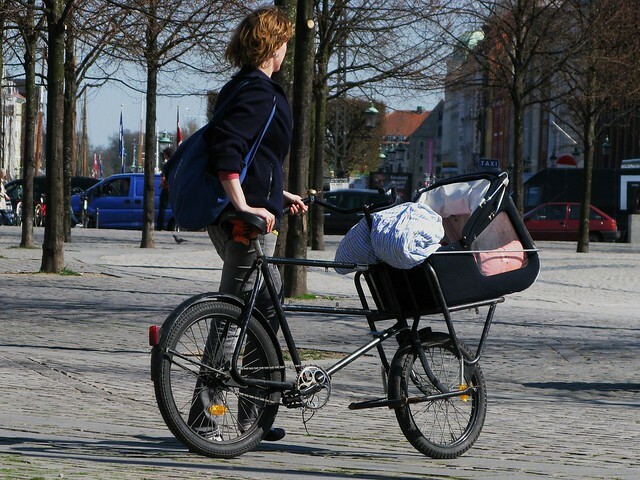 This is a similar solution using a classic Danish short john delivery bike, with the baby on the front rack. I think this highlights yet another major difference in attitude between Denmark (or many parts of Europe) to Canada. If you rode with a young child your considered irresponsible. I knew someone who rode with their young son and was constantly criticized. There was recently a piece of legislation proposed here in Oregon that was going to make it illegal to ride a bike with a child under the age of 6 on it. They said it was too dangerous. Thankfully many cyclists especially in the city of Portland came out against it and it was cancelled. Can you believe that! As a new mom sans car I would love to be able to purchase a cargo bike, alas they are incredibly expensive in Canada (especially with the new HST rate). I rode my bike the entire time I was pregnant, right into the 9th month. I attribute my quick labour and easy pregnancy to my bicycle riding and would recommend cycling to any pregnant woman that is reading this! I love these photos. Here in the US, people are often obsessed with the dangers of putting a kid on a bike, and yes they always want to put a helmet on the child. What is considered "safe" is to keep the kid indoors planted in front of the TV or computer, while eating junk food. Interesting that in our so-called safety obsessed culture, we now have huge numbers of obese children. The problem of obesity in children is now so bad that some doctors are saying we have reached the first generation of people who will have significantly shorter life spans than their parents. What a sad situation. I have a European heart. I may well need to find a way to emigrate. Thanks for this peek into your world. It is so nice to come here and see these images, especially on day like today when Austin is implementing some new bike infrastructure downtown that is driving people crazy. Its nice to know somewhere in the world people can ride bikes without derision. I look forward to when we reach 25% cargo bike ownership by parents in the US...someday. Sigh. You are so lucky. I live in what's apparently the most bike-friendly city in Canada (Victoria, British Columbia) and yet it's way too scary to attach a kid to a bike, especially if you're going up steep hills on narrow roads where the bike lanes just kind of stop existing and angry drivers zoom around you. It's as though the designers of the bicycle infrastructure decided, "Ah, well, cyclists won't be going up these steep roads anyway [even if they are main roads and the only way to get somewhere!] and they'll all just sort of disappear at the bottom, so we don't need to accommodate them." It's nice to see so many options for riding a bike with a baby. I have a one-year old and have been wanting to ride a bike with my child but haven't found any solutions that would work. As previously mentioned, here in the US safety concerns are a big issue. so lovely! buckets 'o kids. Oh, MAN! I thought about getting a Batavus personal bike with a hefty cargo rack on the front, and strapping the baby's car seat to it. People said I was crazy. Now I see I am not crazy at all. They're just not very innovative! Isn't it safety for the babies?. As a Nihola advocate I love this post, however riding with an infant strapped to your back is just dumb. When my 13-y-o daughter was a baby, I carried her in a harness...on my chest. She got used to the breeze in her face EARLY! From there, we went to a rear-facing trailer, then separate bikes -- now she's on a full-suspension MTB, loving it, and I'm looking to get her a premium bike in a year or two. A lot of the 'nanny' attitude in American society is a backlash from the reckless exercise/abuse of rights without the responsibilities that go along with them. It's why I despair of the idea that the US can even come CLOSE to Denmark as far as cycling goes. Love your blog - have read it from afar for ages. Just moved to Copenhagen a couple of weeks ago and ended up buying a Kangaroo. Just COOL! I do the same with my boy - now HE want´s cycling at the top of mountains.